Nick Lavars for New Atlas: The buildup of dust and grime on solar panels do their efficiencies no good, indeed we've seen some creative maintenance solutions such as using autonomous drones to brush them off. But what role does manmade pollution play in this, including the particles that hang in the air? A new study has found that this is taking a sizable chunk out of the world's solar energy production, with big investors such as India and China being hit the hardest. 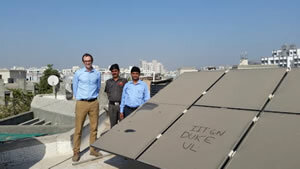 The research was carried out by engineers from Duke University in collaboration with scientists from the Indian Institute of Technology-Gandhinagar, and sought to answer a key question: How much is dust buildup and airborne pollutants impacting the efficiency of solar panels?